This easy summer recipe was one I found in the BBC Good Food magazine. If you haven’t seen or used this magazine before, I heartily recommend it — I’ve tried a whole series of recipes from there recently, and every one has been utterly delicious. 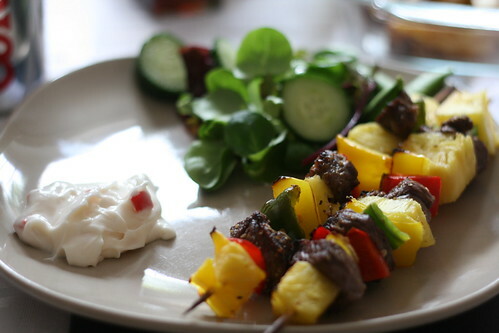 Lamb and pineapple kebabs may seem like a weird combination, particularly with chilli mayo, but it’s actually very good together. 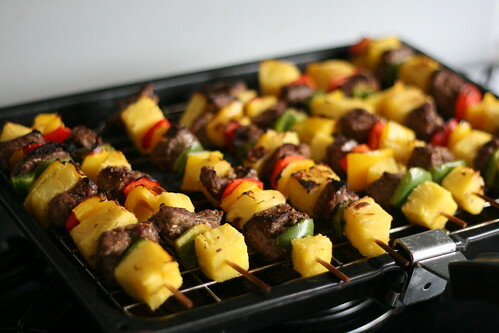 Something about the sweet, acidic pineapple against the heady lamb – it’s beautiful. This was something I made two or three weeks on the trot. It came out perfectly every time. It’s genuinely gorgeous, a really tasty recipe. Plus it’s full of fruit and veg so it’s good for you — always a plus in my eyes. Mix the oregano, garlic and lemon juice together in a large bowl. 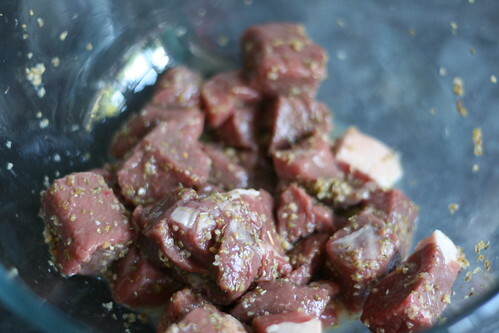 Then add the lamb chunks and mix well so they’re evenly coated. Mmmm, it smelt gorgeous. 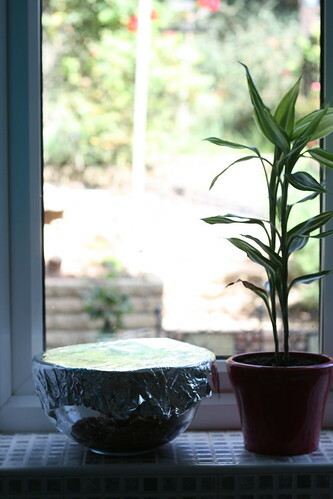 You can go straight from here, but I covered the bowl in foil and left the lamb in the mix to marinate all day. When I eventually cooked the kebabs, the lamb tasted amazing and was really juicy. So if you remember, do this before you leave for work. 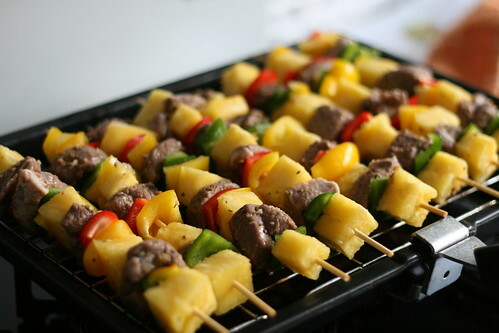 When it comes to making your kebabs, preheat the grill and then deseed the peppers and cut them into chunks. 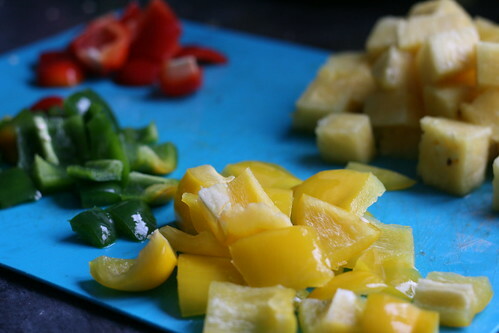 Then cut the pineapple flesh into chunks too. I only had one green pepper so I substituted a yellow one — it doesn’t make much difference to taste, but there was overall too much yellow on the kebabs. 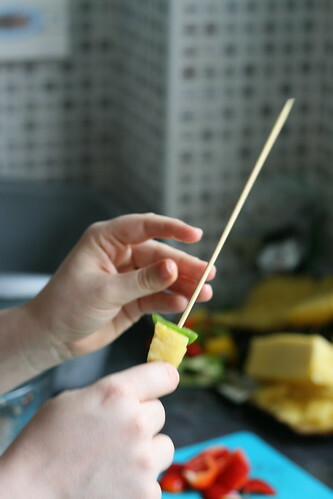 Then it’s just a case of threading the peppers, pineapple and lamb onto 8 kebab skewers, alternating between them so you get a pretty look and an even spread of ingredients. When they’re ready, they should look something a little bit like this. Then just pop them under the grill for 8-10 minutes, turning frequently. 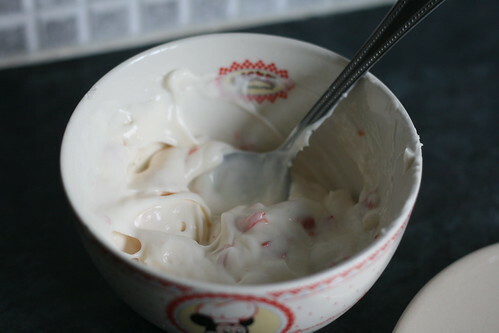 Whilst they’re cooking, deseed and finely dice the chilli and mix it into the mayo with a squeeze of lime juice to make the lovely chilli mayo. …serve them with some wedges, or some salad, and a nice splodge of chilli mayo.